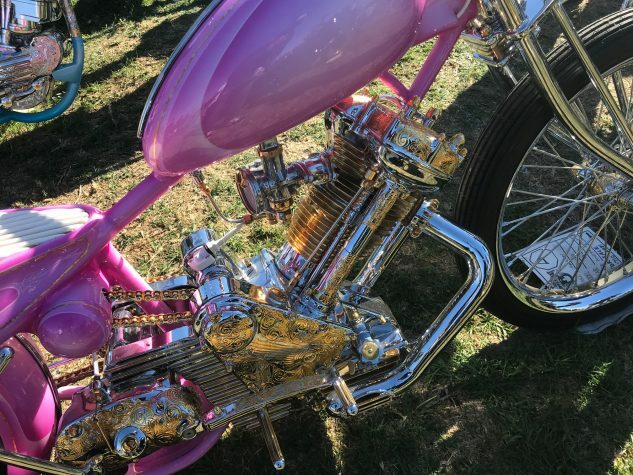 On the other hand, choppers are also a completely unique way of expressing your own individual style and creativity. 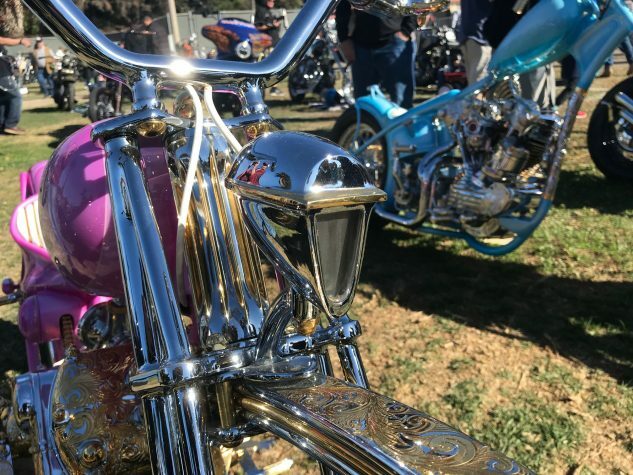 No two choppers are alike, which can’t really be said about the majority of bikes you see on the road today. 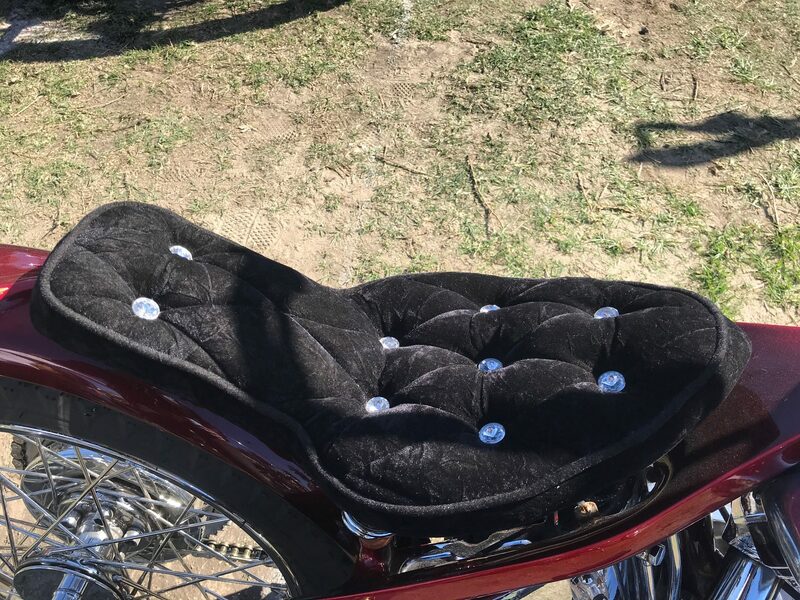 Sure, some might be wild or even impractical in a lot of ways, and most can pretty much only be ridden comfortably by their owners / builders, but believe it or not, they’re often a lot more comfortable and road worthy than they might look, and easy to work on, too. There are basically two types of choppers: There’s the ones that actually get ridden, which I prefer, and then there’s the show bikes, which are often the wilder creations that see fewer road miles. I by no means dislike show bikes – I like them just fine – but it’s the unique utility and functionality of certain parts or the way certain things are put together on a daily rider that make you think, wow, I never would have thought of that, that’s a great idea! Chopper ingenuity. 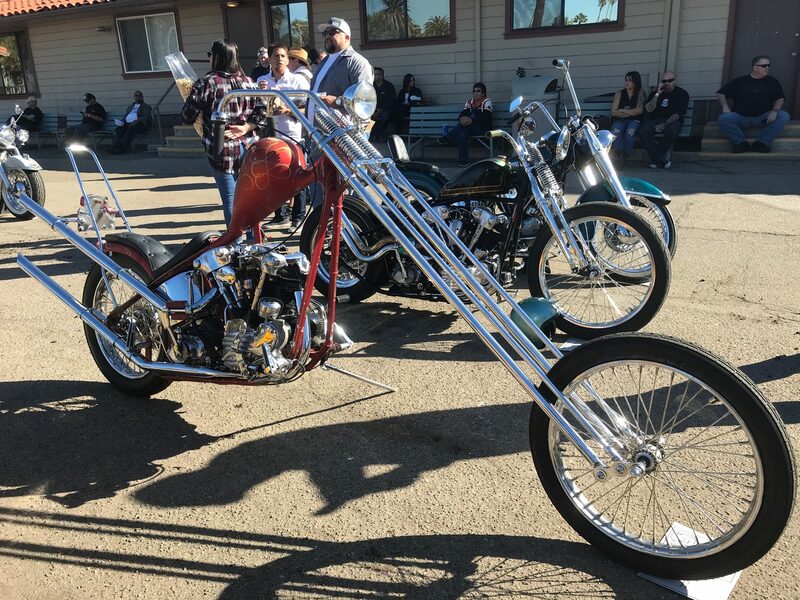 Regardless of the type of chopper, there’s countless hours of labor that go into building each one of them. All the cutting, bending, welding, grinding and machining of parts to make them all fit together like pieces of a puzzle helps a rider really get to know his or her bike, and this helps tremendously when you ultimately have to work on it again, which could be on the side of the road… But that’s all part of the fun if you ask me. It’s a labor of love. This past weekend I attended the 14th annual David Mann Chopperfest in Ventura, California, where there were hundreds of unique choppers on display. By the way, if you don’t know who David Mann is, you should definitely look him and his artwork up. 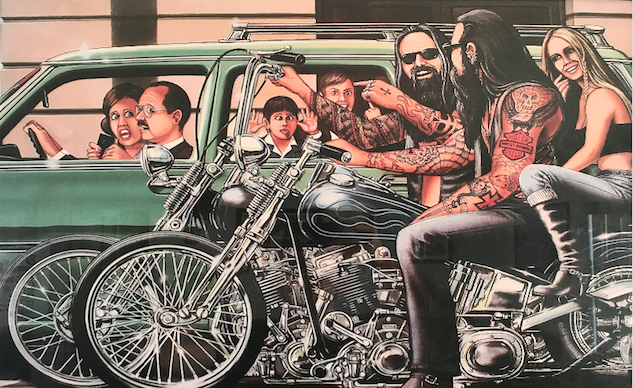 He’s illustrated some of the coolest and most iconic biker and chopper paintings of scenarios a motorcyclist in the ‘60s and ‘70s might have found themselves in. At least a dozen of them can be found on the walls of my living room and garage. 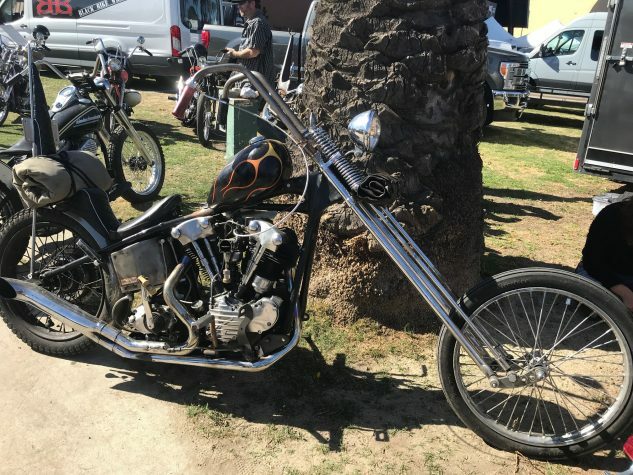 Anyway, below are 10 choppers from the show – some from the parking lot – that I thought were pretty darn unique and cool each in their own way. There were plenty more that could have easily made the list, but 10 is a round number so… enjoy! 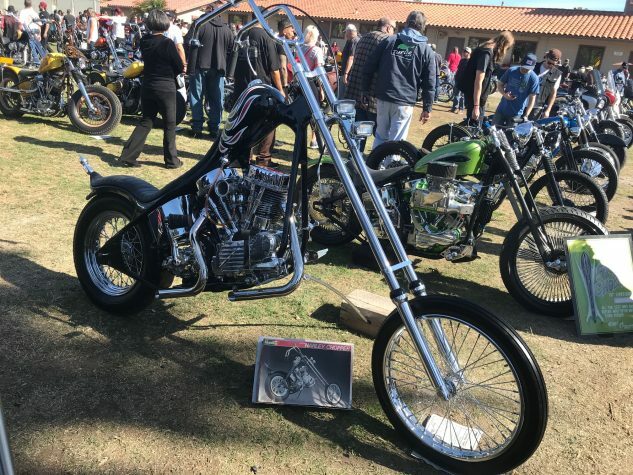 It’s an original Denver’s Choppers survivor that was initially put together with a ’63 Panhead motor, but was then swapped out for a 1947 Knuckle. It has a 28-inch-over springer front end and a very interesting story behind the paint. 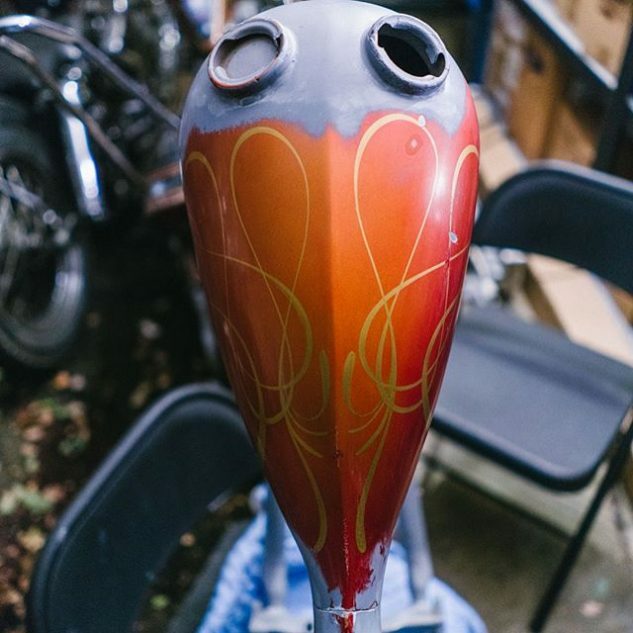 It was covered in primer and when Ben started to remove it, he discovered the orangish-red paint job with gold striping underneath, which was originally done by the late Bobby Kossy. 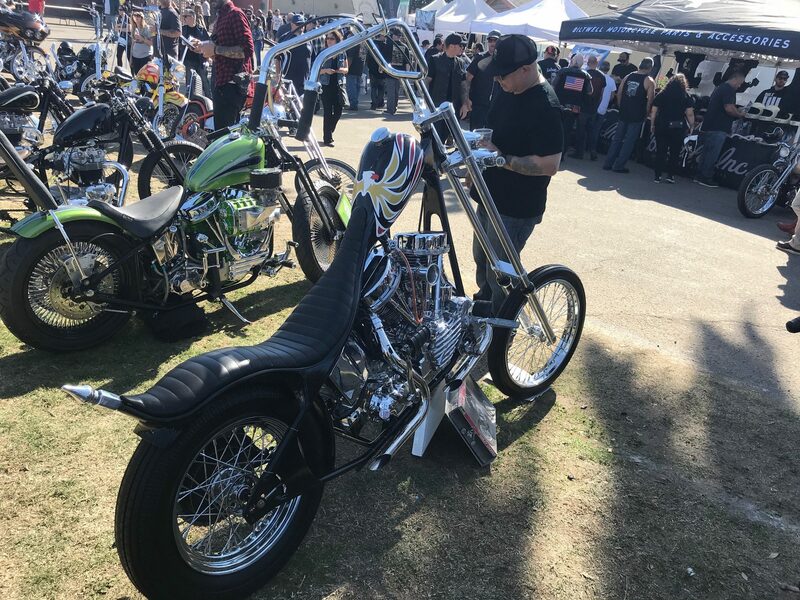 It took a ton of work to get the frame and tank looking how it does now, but it’s no doubt one beautiful survivor chopper. 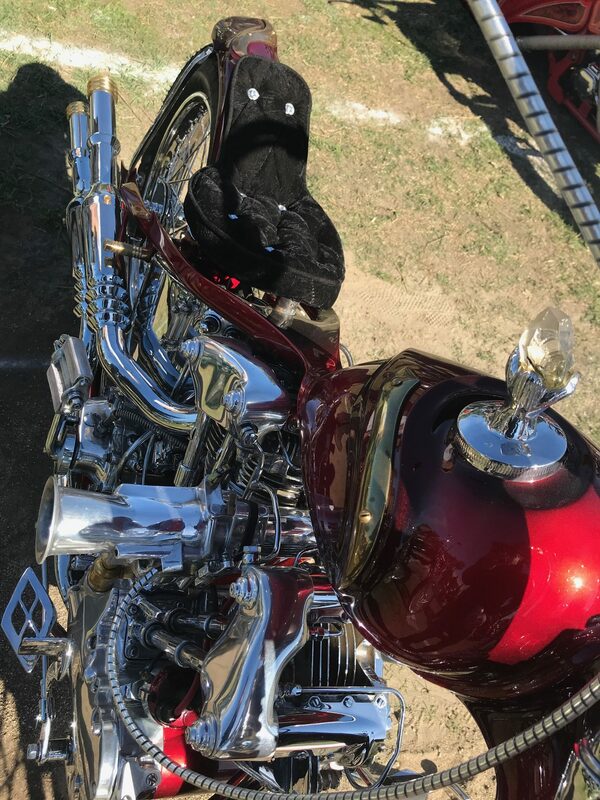 The motor is a 1949 Panther M-100 and there’s a ton of custom engraving and gold-plating – truly a one-off custom. It’s got an engraved leaf-spring front end and slew of other parts that have been endlessly machined, polished and chromed. 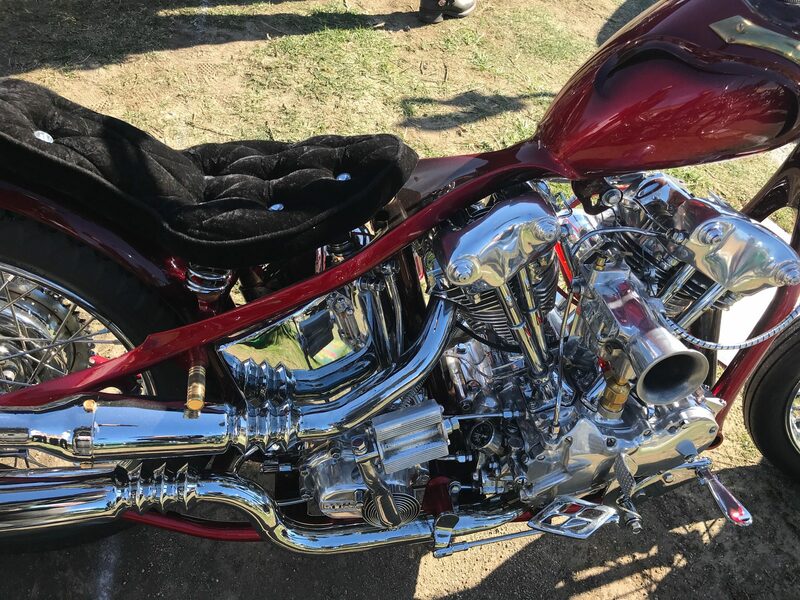 A bike so clean, you could eat off of it. 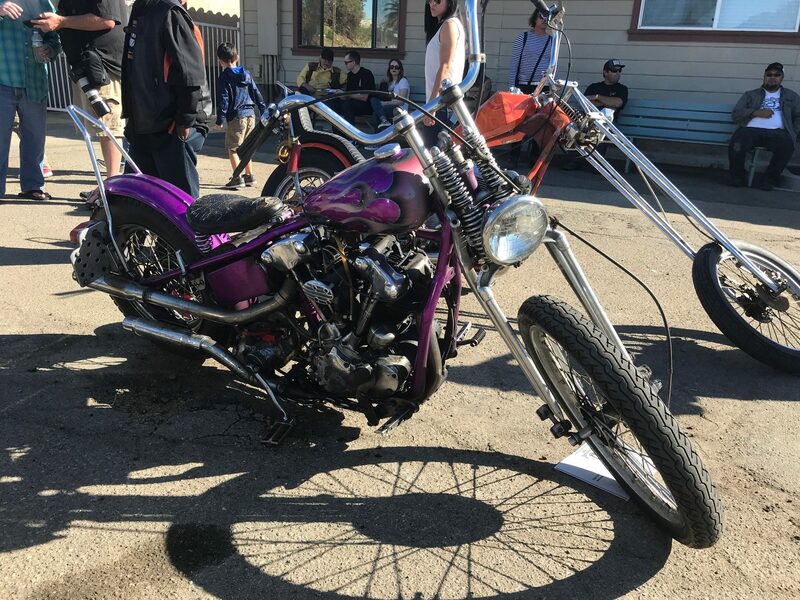 More of your everyday rider that’s definitely not as meticulously finished like the Pink Panther, Joe’s Pan has a wide glide front end with shaved lowers, an S&S carb, custom bird-shooter exhaust pipes and a neat dual headlight setup. 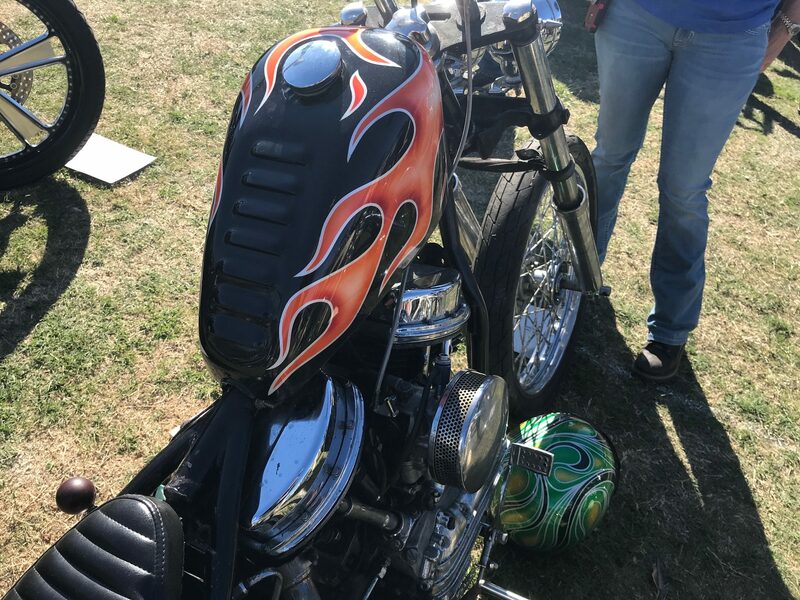 Its Sportster gas tank also has a cool louvered top section. It’s by no means the classiest bike, but it’s definitely tough. 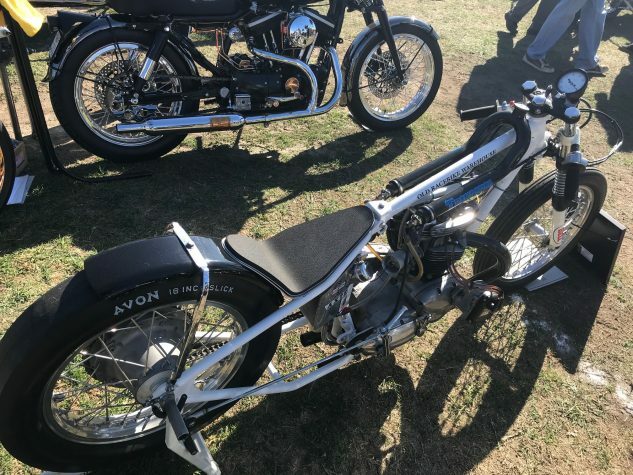 It’s a hard-tailed, non-street-legal, full-on drag bike. The coolest feature of this chopper is definitely its gas tank, which is essentially two tubes, each with their own petcock that feed two individual carburetors. Spark is provided by a Joe Hunt Magneto and the footpegs are mounted right to the rear axle plates. 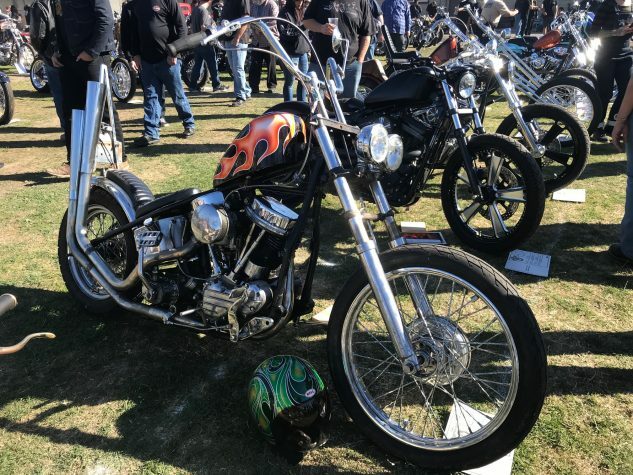 There’s a ton of chopper and MC history behind this bike, as it was originally owned and built by Droopy, the late chopper legend. 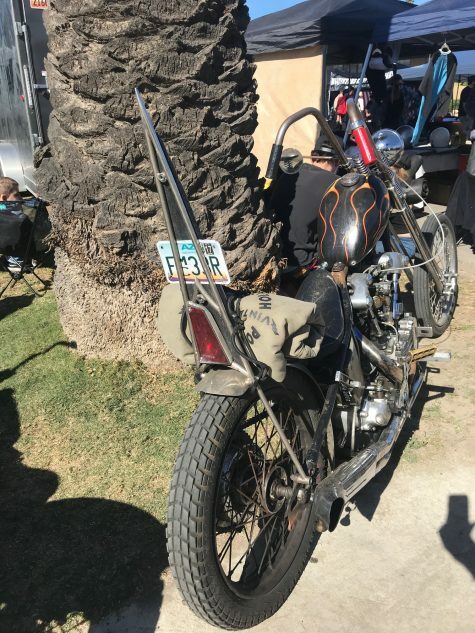 I’d love to go into the story behind the bike, but it’s tale best left private per the family and club’s request. 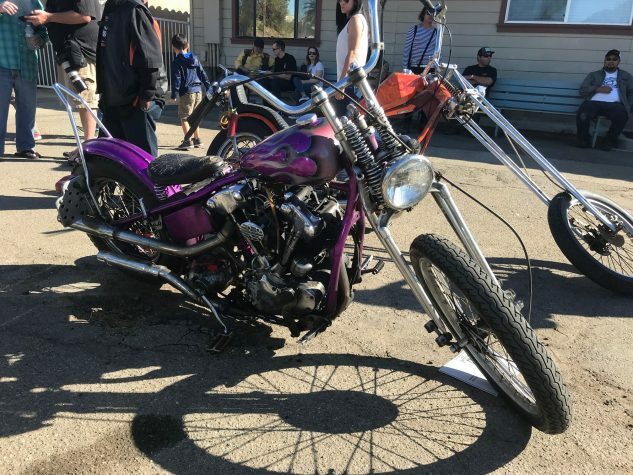 However, what I can say about the bike is that after Droopy’s passing, his bike was going to be sold and shipped to Japan, but it was saved by Eric, and Droopy’s club (to be left nameless), mandated that it must forever remain in the United Stated in the original way Droopy built it. 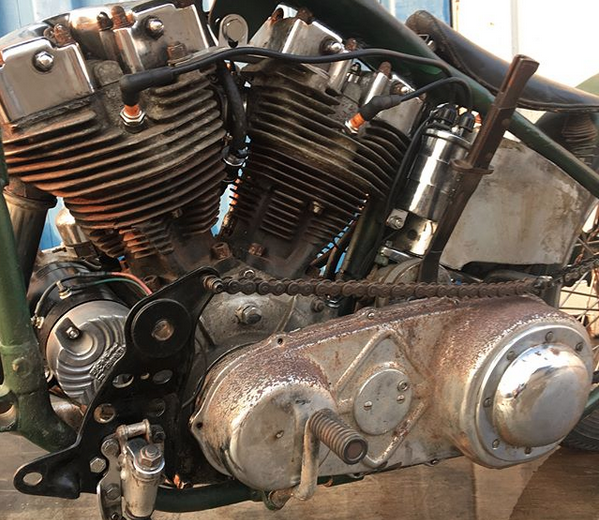 It has an original wishbone frame, VL springer and a totally unique clutch cable setup that runs through the frame’s seat post. 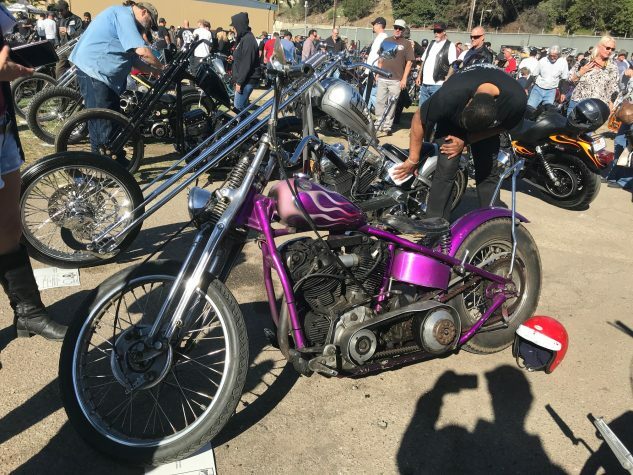 The bike lost its kickstand decades ago and rather than replacing it, Droopy just used the kicker pedal instead. Now, you’re most likely thinking to yourself, no way is that bike rideable… And you’re probably right, but that wasn’t the purpose of the bike’s build. The chopper is actually built to be a full-size, real life replica of the Revell 1/8th scale toy model that was popular amongst kids in the ‘70s and ‘80s. It’s got a narrowed, 29-over front end mated to a de-raked 18-degree neck, and it stands as tall, if not taller, than any average-sized man. Obviously, it’s the most practical bike, but hey, why not? 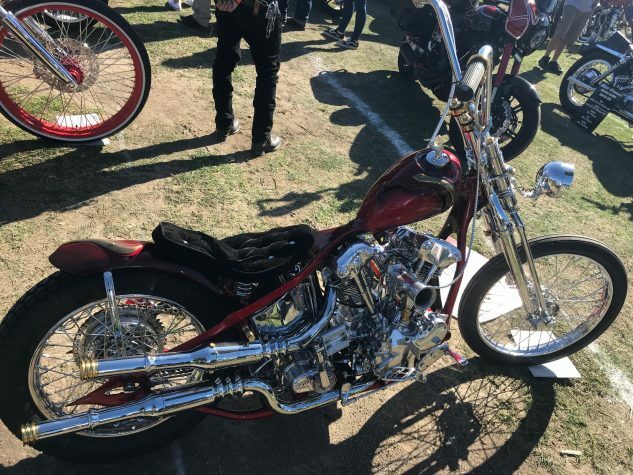 This bike was built by the Stopnik family who own and operate Cycle Zombies in San Clemente, California. 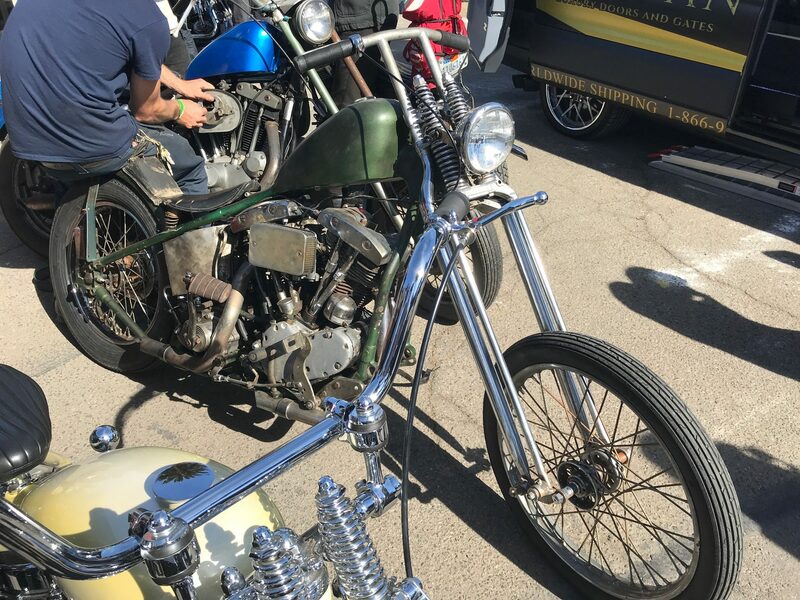 They call it Gang Green and it’s got a 1951 slabside generator bottom end with later model shovelheads inside a wishbone frame. 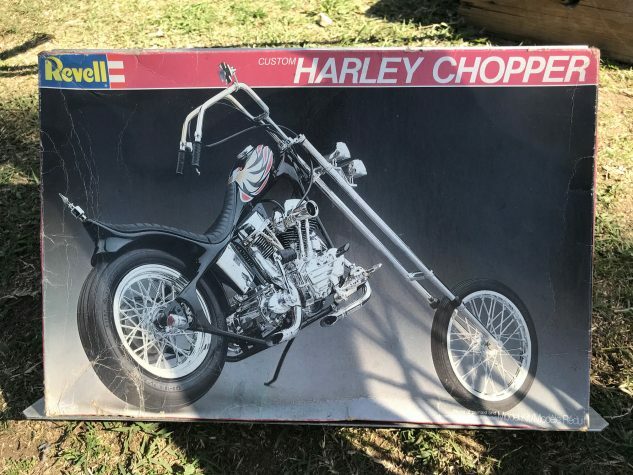 It wasn’t until ’66-’69 that Harley-Davidson made its own Pan-Shovel / Genny Shovel, which makes this build unique. 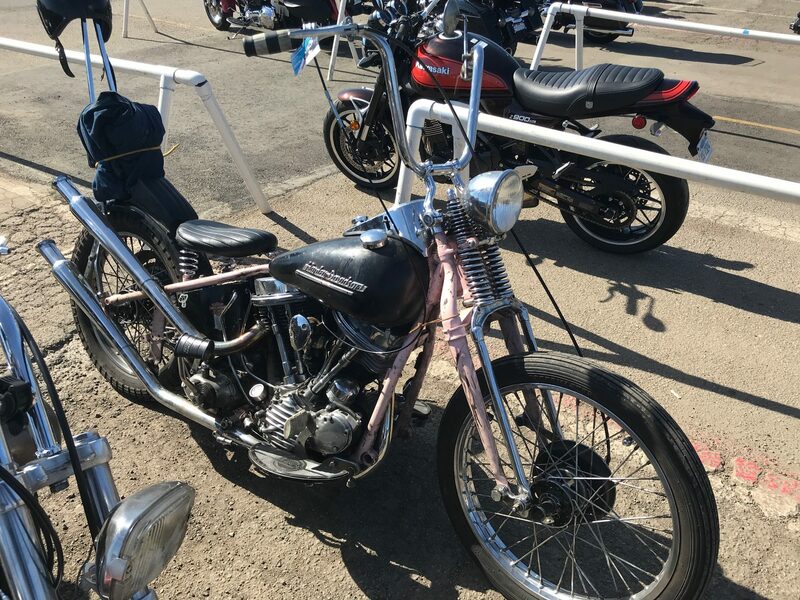 It’s raked to about 33 degrees, has an original H-D springer front end that’s been extended 10-over and also an original Bates seat, p-pad and headlight. By far the coolest part of the bike is actually how its clutch is actuated. There’s no hand lever or foot pedal, instead it’s a chain that the rider steps on to engage and disengage the clutch. Shifting is handled with an old bayonet sword – now that’s chopper. 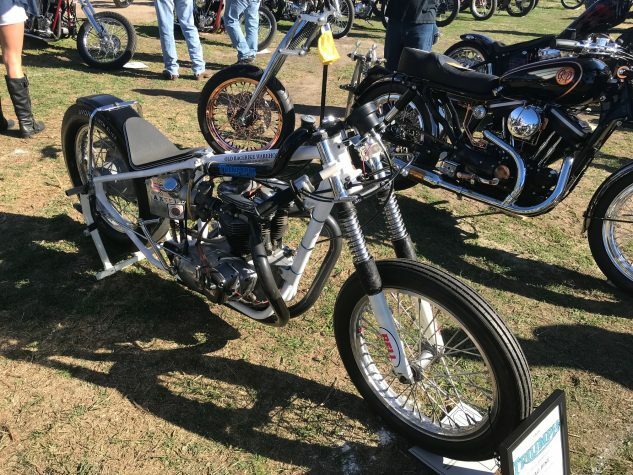 This chopper I found out in the parking lot, but it could have easily been inside the show. There’s not really anything that’s too special about it other than its pink wishbone frame and rear springer fork legs. 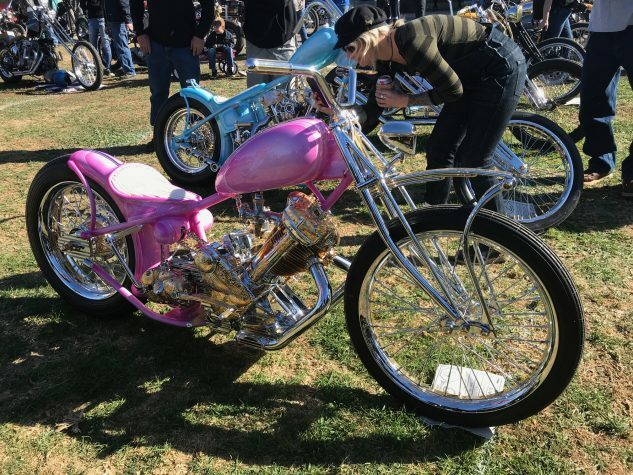 It’s not often you find a tough looking chopper that’s pink… It seems to have mostly original Harley parts, a Linkert carburetor and cool, upswept cocktail shaker exhaust pipes. Simple, but classy. Ryan Grossman of Vintage Dreams is the Knuckle King. He’s built all sorts of choppers, both daily-rider types as well as completely ridiculous show bikes – this is his 1947 EL Knuckle. The bike is completely hand-built, and there’s more custom work than I could even go on to explain, but some of the cool features that I’ll highlight are a narrowed H-D springer, a molded wishbone frame and tank, a rhinestoned seat from Shack Cycles, diamond-shaped mini-floorboards and a crazy, mini-cocktail shakeresque exhaust setup. And you could get lost staring into the depth of Matt Busby’s paint job.